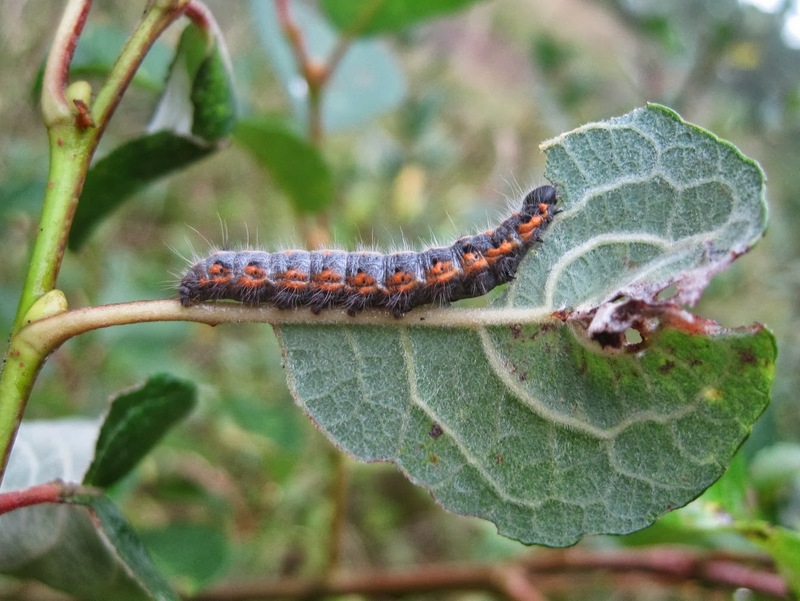 During a site meeting at Pembrey Forest today I noticed several Small Chocolate-tip larvae on sallows and Creeping Willow. Interestingly all were actively feeding - Porter mentions that they remain within a retreat of spun leaves by day and feed at night. A retreat was present near each larva, but they'd evidently decided to throw caution to the wind today. Also noted on sallows were two Dot Moth larvae, and on willowherb a half-grown Elephant Hawk-moth larva. Plenty of Silver Ys nectaring on Devil's-bit Scabious, and a single Rush Veneer also seen. I`ll have to keep an eye out for these, George as it`s a species that I`ve never seen. Thanks.